Although this pub is neither a listed building nor one of London’s Real Heritage Pubs (ie on CAMRA’s London Regional Inventory of Pub Interiors of Special Historic Interest) it is, to quote CAMRA’s South East London Branch’s Pubs Officer, Neil Pettigrew, “a little gem hidden away in the back streets between the western end of the Old Kent Road and southern Bermondsey. I believe it once won the Evening Standard Pub of the Year award. It reeks of authenticity, even before you step inside. Standing alone in an area that today is largely made up of industrial buildings, it is a survivor from another age. The exterior of this small two-storey building is still adorned with old Truman signage. ‘Truman, Hanbury, Buxton & Co Ltd’ is painted on tiles around the top. Frosted windows still contain the Truman name. 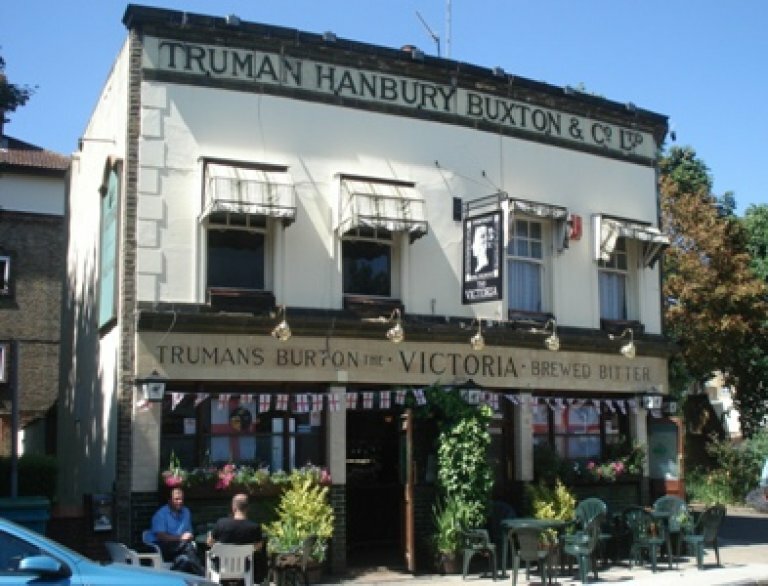 Above them is the legend ‘Truman Burton Brewed Bitters’ in dark writing against pale tiles. The owner (who has been running the pub for 25 years) has encouraged leafy plants to grow on the walls, creating the happy feel of a country pub. Inside can hardly be expected to live up to all this living history, but it comes a pretty close second. 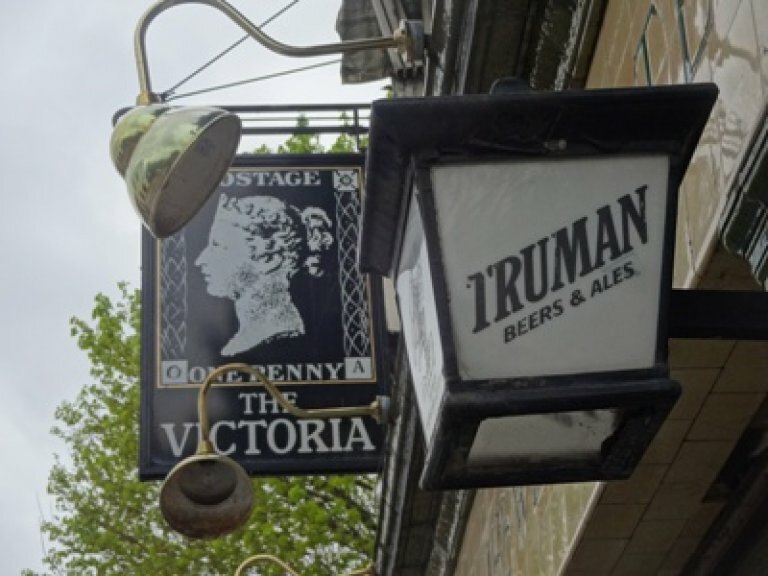 It has been opened up into one U-shaped room around a central bar and is very much a traditional, comfortable boozer. Dark wood matchboard panelling is on all walls. Studded leather banquette seating (not fitted) sits happily along most walls. All around the base of the bar counter is black and white chequerboard tiling, so distinctive of Truman pubs and allegedly intended to be used as a spittoon. Also around the base is an iron foot rest which once could have been filled with hot water so that on winters’ evening customers could warm their feet. Food is served but it is proper pub food at sensible (not gastro) prices.” This was written in August 2008. The Victoria featured on the Knocked 'Em in the Old Kent Road: Evening Crawl of Bermondsey in December 2010.